This item is the Eduardo Lucero dress that Gillian Anderson wore to the Vanity Fair Oscar Party in March of 2001. 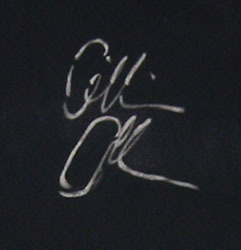 It was originally donated by Gillian to the 2001 NF, Inc. auction. The dress is signed by Gillian Anderson (lower left, on the back of the dress) and comes with a Certificate of Authenticity from the Official Gillian Anderson Website.